If you're looking for unique Boxer Dog Gifts that you would be proud to own or give, then you are in the right place. Welcome to Shepherd's Grove Studio where you will find beautiful handmade pottery decorated with Boxer dogs. Currently we offer a tan Boxer Dog and a Brindle Boxer Dog. Plus, you always have the option to customize the artwork to reflect your Boxer's colors by selecting the "custom color" option on the item page. This way, you can make your Boxer item even more special and personalized (there is a small art fee for custom work). We have a variety of Boxer Dog Items, including Boxer dog mugs, wine stoppers, treat jars, sugar bowls, creamers, and dipping bowls. You can decorate your whole kitchen and table top in Boxer Dog Merchandise should you want to! We regularly add new pottery shapes to our line-up and all of our items are exclusive to Shepherds Grove. All of our stoneware pottery is made in-house from clay to finished product. So not only are you buying original Boxer Dog merchandise, but you're also getting all of the care and joy that is infused into our Boxer Dog items as part of the creative process. Additionally, you also receive the benefit of durability. Our stoneware is great for daily use and we encourage you to microwave and machine wash to your heart's content. 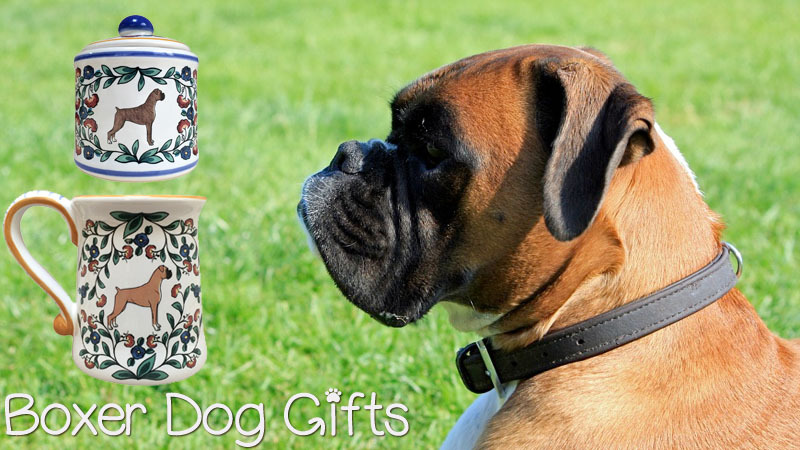 Shop our unique offerings now – we're sure you'll find the perfect Boxer Dog Gift!